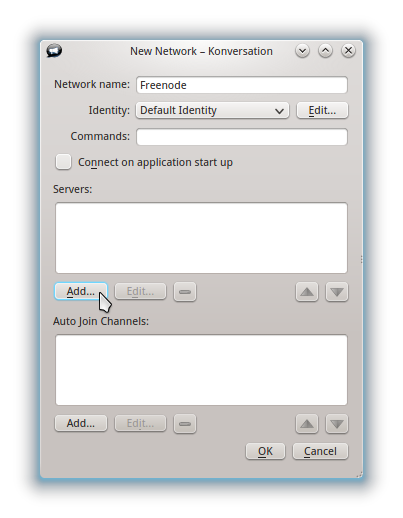 Konversation's "New Network" dialog with the mouse pointer above the button that opens the "Add Server" dialog. 20:22, 10 June 2012 403 × 518 (44 KB) Hein (Talk | contribs) Lowercase freenode's name. 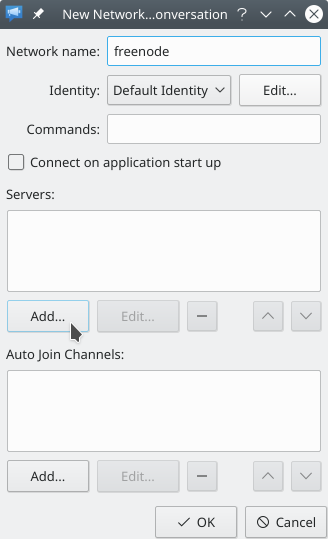 18:50, 10 June 2012 403 × 518 (44 KB) Hein (Talk | contribs) Konversation's "New Network" dialog with the mouse pointer above the button that opens the "Add Server" dialog.